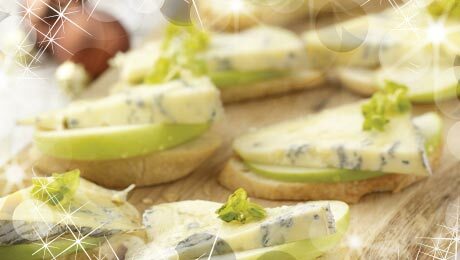 I love Blue cheese, it is excellent as a table cheese or crumbled on salads and makes a fantastic addition to this canapé, if you don’t like blue cheese, you could use goats cheese. Slice the bread into thin slices approx 1cm thick and lay on a baking tray. Drizzle with a little oil and place into a preheated oven for 6 minutes until crisp, remove and set aside. Place a slice of apple onto each Crostini, and add a sliver of blue cheese. Drizzle with a little honey, if using and garnish with some fresh oregano. Serve immediately.